The Tampa Bay Rays is a professional baseball team from St. Petersburg, Florida. The team competes in the Major League Baseball (MLB) as part of the American League East Division. Since its founding in 1998, the Rays have played their home games at the Tropicana Field. The team was formed after nearly three decades of attempts to gain an expansion franchise or trying to convince other teams to move to the Tampa Bay Area. The Tampa Bay Rays entered the MLB as an expansion team in 1998. The franchise has achieved success by making it into the playoffs several times since entering the league and even reaching the World Series in 2008. In 2017, the Rays finished in 3rd in the AL East Division. This year they will look to beat out the New York Yankees and the Boston Red Sox in a very competitive AL East and earn another American League Pennant. Get your 2018 Tampa Bay Rays tickets and head out to Tropicana Field to be apart of the championship run. Over the short history of the Tampa Bay Rays, the team has seen quite a few interesting moments. The Pennant Winners: On 19th October, 2008, in the Game 7 of the ALCS, the Tampa Bay Rays gave fans memories to last a lifetime. Playing against the defending champions, the Boston Red Sox, at the Tropicana Field, the Rays did not have much hope for victory. Matt Garza was called on to start the game, and he pitched the game of his life. Later rookie David Price was also called on to sweep the Tampa Bay side towards victory. The young and fresh, Price, with little MLB experience helped crown the Rays American League champs, winning 3-1. Postseason for the first time: After ten years of being in the league, the Rays finally made it into the postseason for the first time in 2008, in a game filled with excitement and ecstasy. With more than 36,000 fans watching the game held at the Tropicana, a foul pop to Evan Longoria off the bat of Joe Mauer helped the team with the historic 7-2 victory. The Rays had truly done what no one else thought was possible, stunning the entire nation. Even though the Tampa Bay Rays have multiple rivalries, the two major ones are against the Boston Red Sox and the New York Yankees. Boston Red Sox: This rivalry dates back to the 2000 season when Gerald Williams from the Rays took exception to being hit by a pitch from Pedro Martinez and charged the mound. This resulted in a game full of ejections and multiple moments of retaliation from both side. In the years that followed, there have been several incidents that have added fuel to the fire. One such incident was in 2005, which caused two bench-clearing fights within the duration of the game. The rivalry reached its highest point in the 2008 season, with a full-scale brawl at the Fenway Park. New York Yankees: Both, the Yankees and the Rays are part of the AL East division and play several times every season. There has always been a strong feeling of competitiveness and resentment between these two rivals. The main reason for this rivalry is attributed to the fact that the Yankees hold their spring training camp in Tampa, thereby causing the fan loyalty of the area to be divided. The rivalry got more heated in the spring training of 2008, when a home plate collision between the Yankees’ Francisco Cervelli and Rays’ Elliot Johnson followed by a spikes-high slide by Yankees player Shelly Duncan, straight into the second baseman of the Rays Akinori Iwamura. This caused the Rays outfielder Johnny Gomes to charge in and knock Duncan to the ground. In the short amount of time since its formation, the Tampa Bay Rays have seen quite a lot of great names on its roster. Carl Crawford is one of the most notable players from the Tampa side. He leads the franchise’s history in average runs, hits, RBIs and stolen bases. Between 2002 and 2010, he was truly the heart and soul of the franchise. Another big name is Evan Longoria, who became the face of the franchise after the departure of Crawford. The 27-year old is very powerful in his game, with amazing defense capabilities and hits in the clutch. In the first four seasons alone, he managed to blast more than 100 homers and 400 RBIs and is only a short distance away from becoming the best player ever at Tampa Bay. James Shields, also known as “Big Game James” has always been an integral player from the Tampa side, because he wins games, especially the big ones. The 2011 year was a terrific run for the player with a 2.82 ERA and 16 wins in total. For fans of the team, now is the right time to grab these Rays baseball tickets. The team is already deep into the season, with upcoming games scheduled against the New York Yankees, Baltimore Orioles, Boston Red Sox, Chicago White Sox and many more competitive teams. Games you certainly don’t want to miss are those at the Tropicana Field. With the advantages that come with playing on the home ground, the Rays will truly shine this season. Located in St. Petersburg, Tropicana Field is one of the few dome stadiums left in baseball. It also has the smallest seating capacity of 31,000, which offers fans a closer look at the action. Tropicana Field hosts 35-foot, 10,000 gallon touch tank that is filled with cow-nose rays that were taken from Tampa Bay waters that allows fans to get up close and personal with these exotic animals. Grab your Tampa Bay Rays tickets now and get ready for a season exploding with action! Our process for purchasing cheap Tampa Bay Rays tickets is simple and fast. There are so many online ticketing sites, that it can be hard for customers to find the right place to buy Tampa Bay Rays tickets at the cheapest price. At ScoreBig we think of our customers first and foremost. We offer daily deals for Tampa Bay Rays events, so our customers can get the best seats for the best prices. ScoreBig will always go above and beyond to offer the cheapest Tampa Bay Rays tickets on the market. The Tampa Bay Rays schedule above, displays all available events for 2019 and 2020. Once you find the event that you would like to go to, click the red “Get Tickets” button. It is located on the right-hand side of the event listing, it will take you to an Tampa Bay Rays event ticket page. ScoreBig's event ticket page will display all available Tampa Bay Rays tickets for that event. On the event ticket page to help with your search for the right Tampa Bay Rays tickets, use the filters at the top to select quantity, price range, and more. There is also an interactive seating chart so you can pick where you want to sit. When you are ready to buy a ticket, click on the listing, and you will be directed to ScoreBig's checkout page. Upon completion of the information fields, your order will be processed and your Tampa Bay Rays tickets will be delivered via email, mail, or to your mobile device. What makes ScoreBig’s site stand out from the rest? We are constantly analyzing our competitors to improve our site, service, and prices. ScoreBig.com employees strive to offer the best process and experience to buy cheap Tampa Bay Rays tickets. Our goal is to get you the best seats to Tampa Bay Rays events. We offer daily discounts on our site and for special promotions check out our newsletter. If there are no Tampa Bay Rays events currently available, you can use our search feature at the top of the page to see a list of all popular events going on near you. No matter your price point, we have all the best deals and discounts on Tampa Bay Rays tickets. For more information on prices of Tampa Bay Rays tickets and the schedule for Tampa Bay Rays, check out our listings above. The last thing you want to find out is when the Tampa Bay Rays event you wanted to go to is sold-out. Don’t worry in many cases ScoreBig has affordable tickets to sold out events. We sell tickets from GA all the way to premium seating and parking. Skip the scalpers in the parking lot and get your tickets online from top Tampa Bay Rays ticket brokers. We get you in all events, buy your Tampa Bay Rays tickets here from a brand that many trust and rely on for all their ticketing needs. ScoreBig offers a 100% money-back guarantee. If you have been in search of cheap tickets for Tampa Bay Rays, ScoreBig by far is the best option. That’s why ScoreBig has more loyal customers than any other ticketing site. 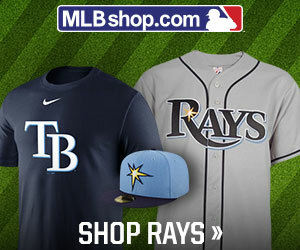 Shop at ScoreBig for safe and secure Tampa Bay Rays event tickets.